Our newly renovated hotel is a hidden gem for lodging in Prescott, Arizona, with all new interior furnishings, a beautiful outdoor brick patio with fire pit, and a sparkling new outdoor pool. Settle in for a dreamy night in one of our spacious rooms with crisp sheets and soft pillows. Whether you’re visiting for business or leisure, our lodging in Prescott, AZ provides the complete guest experience and warm hospitality you’re seeking. 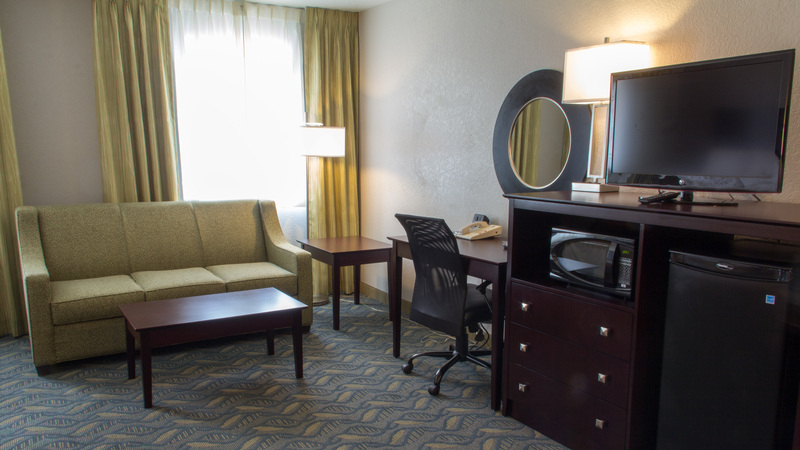 Relax in your room with convenient amenities specially added for your comfort. Watch your favorite show on the 32” flat-screen HDTV from the comfort of your bed. Store snacks and cold drinks in the 4-cubic-foot fridge or heat up takeout in the microwave. Each of our Prescott accommodations features a designated workstation and complimentary Wi-Fi to answer work emails or upload pictures of your trip to the event city of Arizona. With on-site amenities and services such as our dedicated dog run and bike wash station, there’s a reason our dog-friendly lodgings in Prescott, Arizona always rise above the rest. Our 2 Queen Bed room is perfect for groups! This non-smoking room features brand new interior furnishings, 32” flat-screen HDTV, large refrigerator, microwave, and complimentary high-speed Wi-Fi. 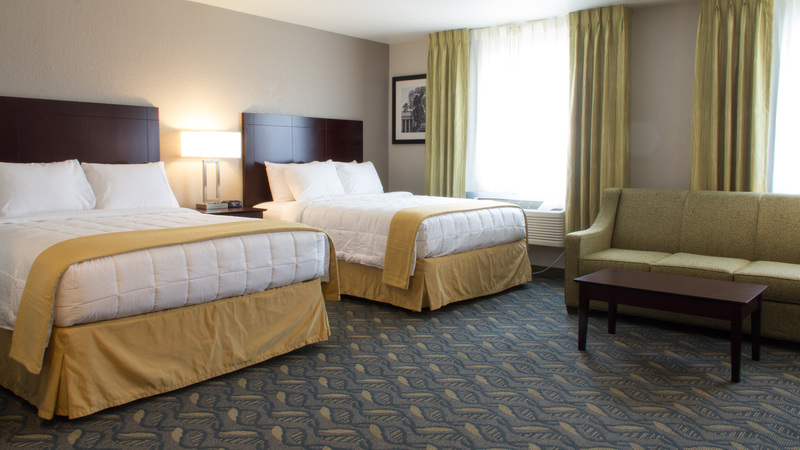 Find the extra space you’re looking for in our 2 Queen Beds room. This non-smoking room features brand new interior furnishings, 32” flat-screen HDTV, large refrigerator, microwave, and complimentary high-speed Wi-Fi. This unique suite combines 2 of our newly renovated rooms to create 1 comfortable master suite. 1.5x larger than our standard rooms, this non-smoking suite includes a larger 55” HDTV and a freezer in addition to a fridge. Six guests can comfortably sleep in the suite’s 2 queen beds and sleeper sofa. Each of our Prescott accommodations features a desk as a designated workstation, as well as complimentary Wi-Fi to answer work emails or upload pictures of your trip to the event city of Arizona. Relax and unwind in your recently upgraded lodgings in Prescott, Arizona. 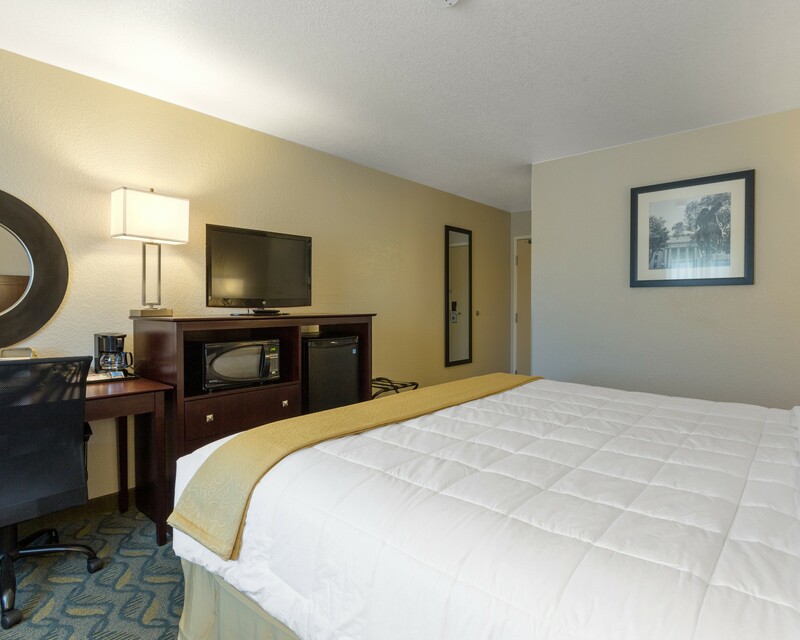 This non-smoking room includes brand new furnishings, 32” flat-screen HDTV, large refrigerator, microwave, complimentary high-speed Wi-Fi, and a little extra space for your comfort. Relax and unwind in your recently upgraded lodgings in Prescott, Arizona. This non-smoking room includes brand new furnishings, 32” flat-screen HDTV, large refrigerator, microwave, and complimentary high-speed Wi-Fi. Enjoy these accessible lodgings in Prescott, AZ during your next visit! 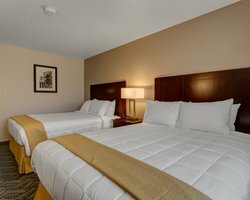 Sleep in comfort in the cozy king bed and enjoy this non-smoking room’s brand new furnishings, 32” flat-screen HDTV, large refrigerator, microwave, and complimentary high-speed Wi-Fi. Our accessible bathrooms include a roll-in shower in some and grab bars with a tub/shower combination in others. Please contact our front desk at (928) 776-1282 for any questions about your reservation.